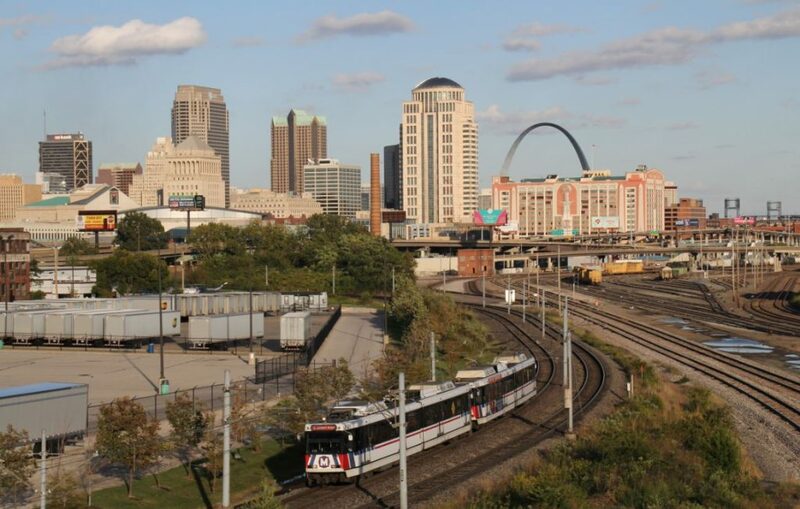 Update: Due to the postponement of the St. Louis Cardinals game this evening, MetroLink will operate on a normal Wednesday schedule. It’s going to be a busy few days in downtown St. Louis as thousands of sports fans will converge to watch the St. Louis Blues take on the Nashville Predators in the second round of the Stanley Cup Playoffs, and the St. Louis Cardinals face off against the Toronto Blue Jays and Cincinnati Reds. Metro will provide extra MetroLink service during the evenings on Wednesday and Friday, making it easy to get to and from the games and pre-game rallies. To avoid sitting in traffic and looking for parking, park at any of the 21 free Park-Ride lots located at MetroLink stations in both Missouri and Illinois, and purchase a round-trip MetroLink ticket for $5 to ride to any of the six MetroLink stations serving downtown St. Louis, including the Stadium MetroLink Station outside of Busch Stadium and the Civic Center MetroLink Station, just steps away from the Scottrade Center, where the Blues will face the Predators. MetroBus is another option. Hop on one of more than a dozen MetroBus routes to the Union Station MetroLink Station, located just west of the Scottrade Center. If you’re headed to the Cardinals game, catch the #40 Broadway or #99 Downtown Trolley, which both have stops near Busch Stadium, or take a ride on the Redbird Express, which provides direct service from St. Clair Square in Illinois to Busch Stadium. The first Redbird Express leaves St. Clair Square two and half hours prior to game time and operates every three to five minutes. In addition to various sporting events, the FIRST Robotics Championship returns to St. Louis this week, kicking off tomorrow through Saturday. The championship will take place at multiple venues throughout downtown St. Louis – including the America’s Center, Marriott Grand Hotel and St. Louis Union Station. To plan your trip, download the Metro On The Go app or use Trip Planner.